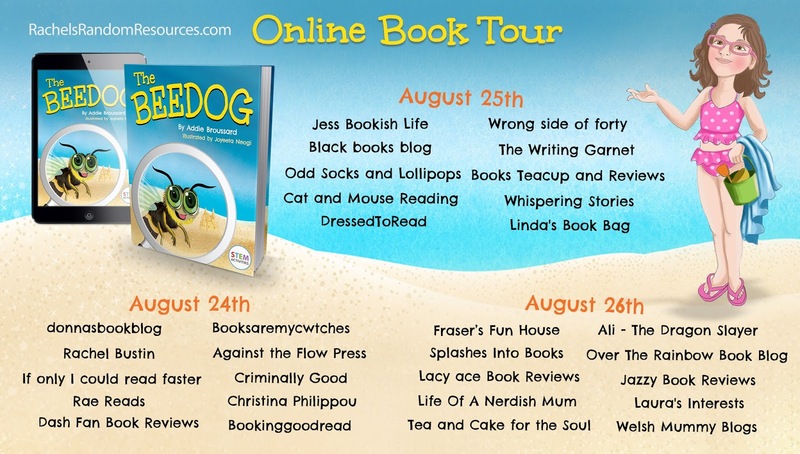 Today on Life Of A Nerdish Mum, I am reviewing a fabulous children's book, The Beedog: An Insect Discovery In Portugal by Addie Broussard. 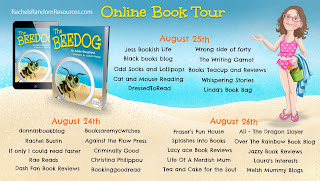 The Beedog is a really fun way to get your little one interested in paying more attention to the world around them. 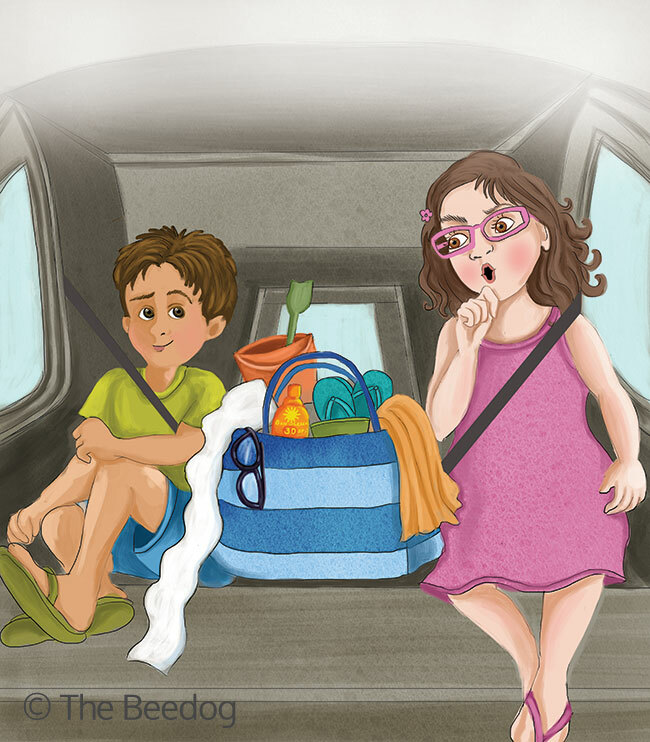 Manny and Cora head to the beach and discover an insect they haven't seen before and the story follows them researching what kind of insect it actually is as well as then sharing their new found knowledge with their school friends. The story is fun and shows the children playing as well as learning, showing a good balance. The illustrations are beautiful and the joy that comes off the pages, matches the tone of the story. 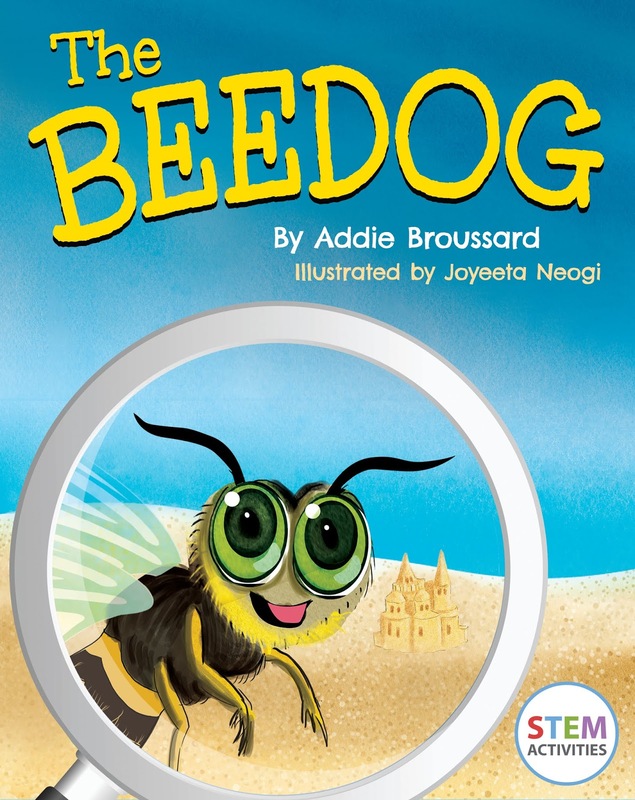 The book is also filled with facts as the children learn about the "Beedog" and there are resource references included if you wanted to go and find out more, including a video of the insect itself. I like the inclusion of information about other wasps and at the beginning there is some information about Portugal and the language used. 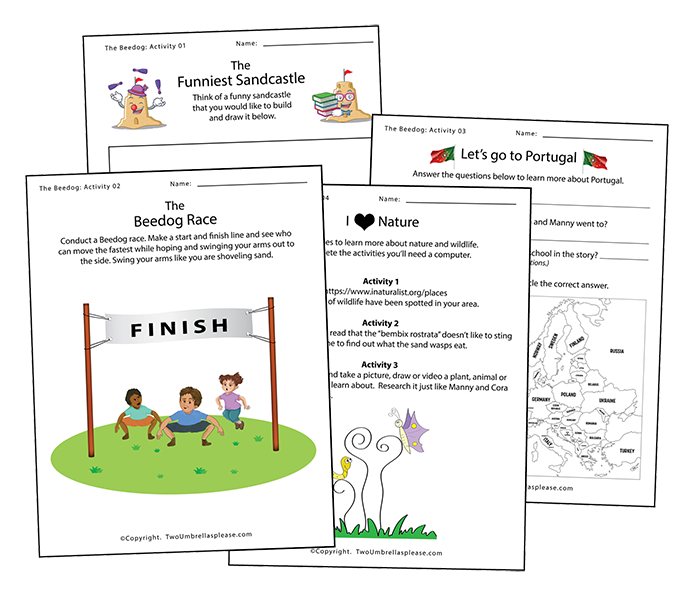 The activities that are free to download are all excellent and cover a range of skills and topics. I particularly enjoyed the I Love Nature page encouraging children to go outside and find something that they can come home and research. I also liked the page with questions about Portugal. There is something for everyone though with colouring, drawing and exercise pages too. Overall a really wonderful book and resource and one I will be going back over with mini Nerdling and we will be completing some of the worksheets more than once they're that much fun (and educational). Addie is an avid traveller, and once went on a solo journey to fifteen countries in one year. When she encounters something unique, she writes about it. Her first published picture book, The Beedog, is about a curious insect that she found in southern Portugal. Addie began her writing journey when she was just nine years old, with a book called Doggienauts. That book has been updated and is set for publication in 2018. 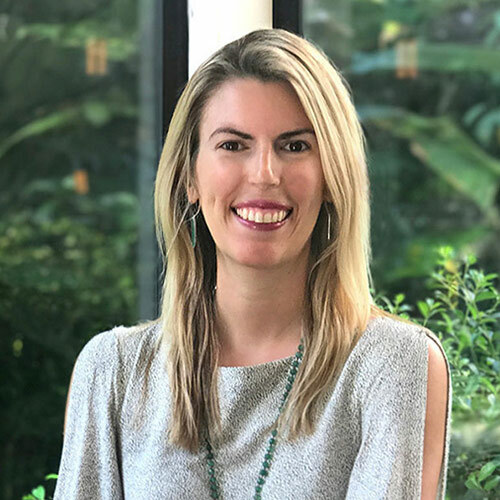 Addie is originally from the United States and is currently a full-time traveller. Home is where her suitcase is. Today's post is another one talking about a super fun activity that we participated in over the summer holiday and that I wanted to share with people. As you can probably tell from the header/title I'll be talking about a Zoolab session myself and Nerdish Dad went to with the Nerdling's. In our library there is a separate room which is the children's library and this is where they hold any of the sessions aimed at children. We got there early and got ourselves seats and I'm glad we did as it was very well attended. There was room for everyone, but I wanted a good spot for the pram. 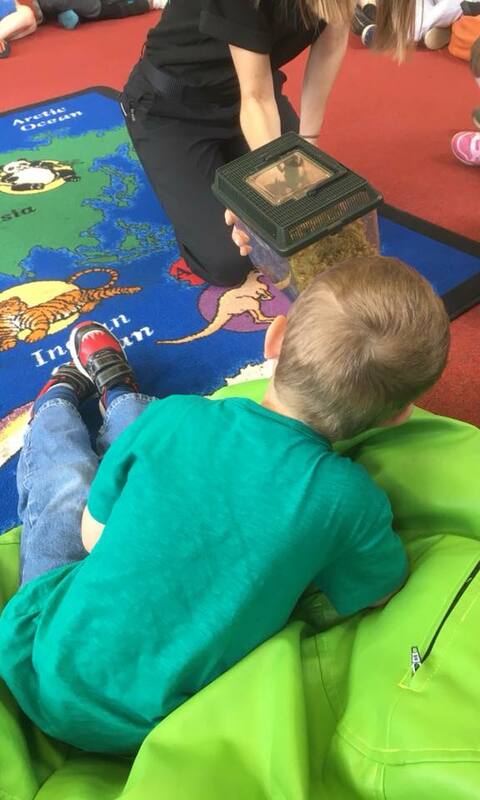 Our Ranger was called Laura and she instantly took control of the room and had the children sat down and quiet, with no effort at all, which is incredibly impressive with a room full of excited children! She gave the low down on being quiet so as not to worry the animals and how important it was to wash our hands after touching any animals and she promised stickers at the end as long as the children promised to wash their hands. I wish I could tell you word for word the whole story that Laura told to introduce each of the animals that she brought out, but the short version is that the animals had heard about Hippos (I'm pretty sure it was Hippos) that were in need, so they decided to enter a talent competition at the carnival down the road so that they could send them things they needed. The first animal that came out was a Madagascan Hissing Cockroach. In the talent contest the cockroach had eaten all the cakes in the baking competition! The cockroach the children were handling, Luna, was actually heavily pregnant and I have been reliably informed by Laura herself that she had her babies that very night!! The second animal that came out was a Chilean Rose Tarantula. 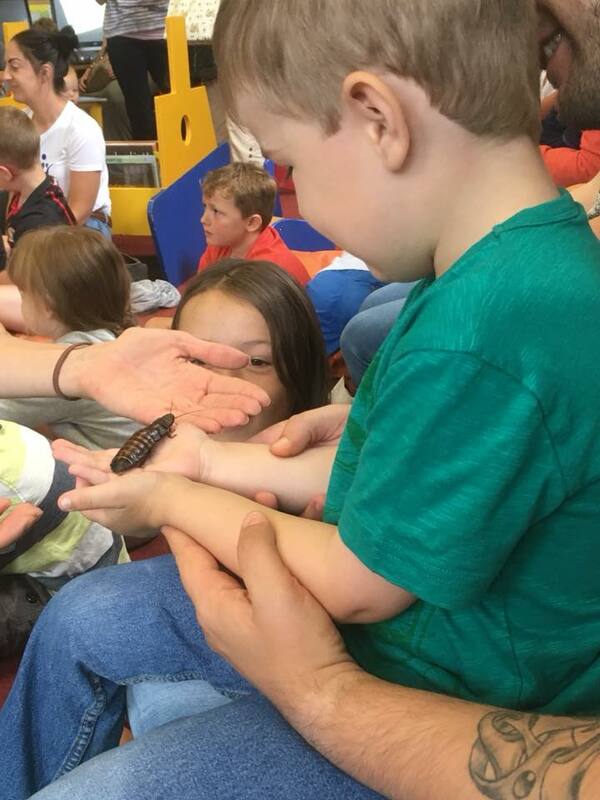 The children couldn't handle the tarantula as they were very nervous and we didn't want to stress them out, but Laura showed them round and made sure everyone had a good look. In the story, the tarantula was throwing balls through hoops and had heard a whispery voice, giving them hints as to how to win. The next animal we learnt about was a white tree frog, now this we definitely couldn't handle because they tried to escape the minute Laura opened the lid. Can you imagine the carnage of loads of kids trying to catch an escaping frog!! Again though we got a really good look and the story continued with the frog taking part in the singing competition. The final animal was my absolute favourite and he was absolutely gorgeous! 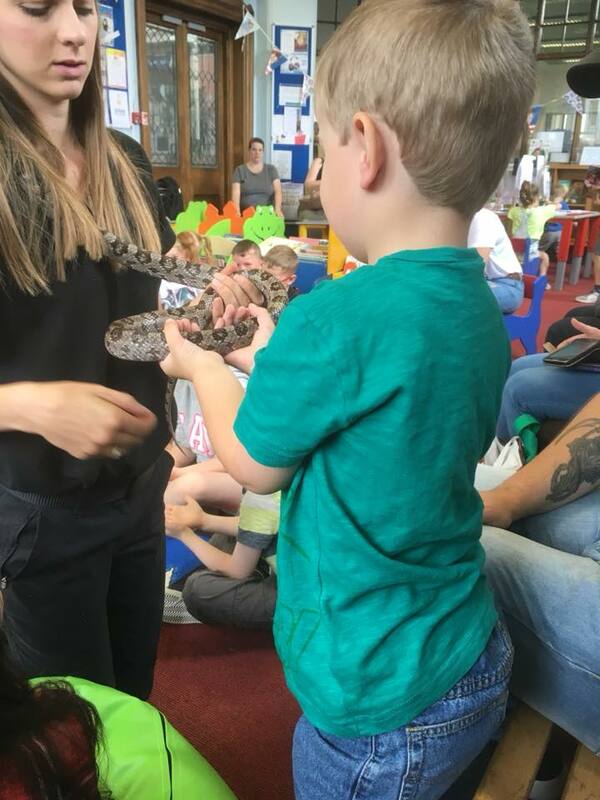 He was a corn snake called Ozzy. He wasn't the usual gold colour either, he was a silver and it was beautiful. The kids at this point needed a reminder to keep quiet so Ozzy didn't get stressed, but considering how long we'd been there, they'd all done really well. Throughout the session we learnt loads of facts about each animal and it was done it such a wonderful way, the children wouldn't have even noticed that they were learning. As an adult I loved the story and it really kept everyone engaged and it certainly made me at least laugh out loud more than once! I'm really hoping the library keep up with the excellent bookings that they have been making as I'm loving the fun and education it's providing for the Nerdling's. 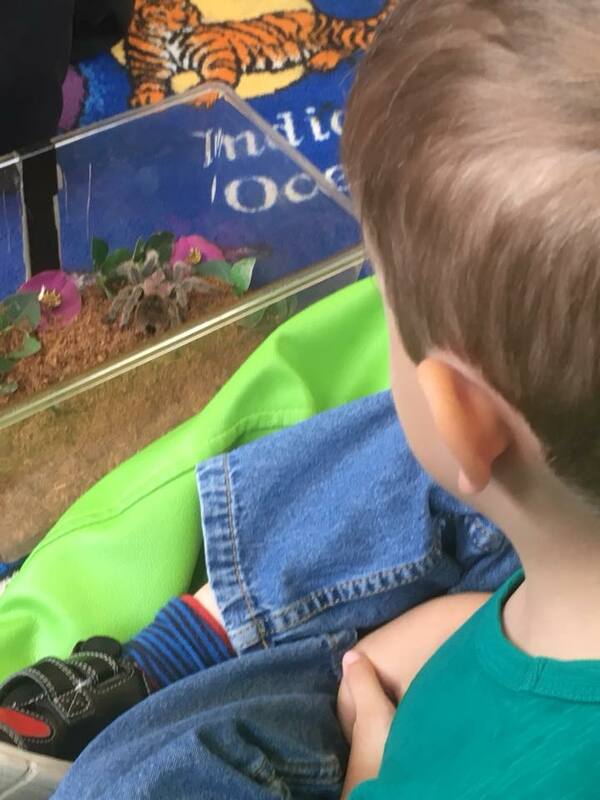 If you get chance to go to a Zoolab session, I would 100% recommend that you do because they are incredibly interesting and fun no matter how old you are! As an aside, I was so proud of mini Nerdling as originally he didn't want to touch the animals at all. He then agreed to at least stroke them, but when the animals started to come out, he was so excited and wanted to hold all of them and did a really good job of it as you can see above! For more information about Zoolab, check out their website - here! Na na na na na na na na BAT WALK! Hi everyone! I know it's been a while and I'm still supposed to be on "maternity" from my blog, but I've been missing it and I've been to a few events recently that I really wanted to share. 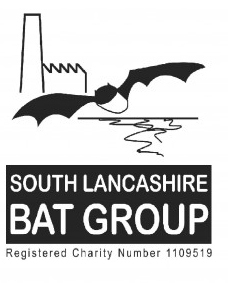 The first event I want to talk about is a Bat Walk that I participated in on Wednesday the 15th of August at Bold Venture Park in Darwen, Lancashire. Each summer I plan out as many things as I can for Mini Nerdling and me to do, in my search I saw an advertisement for a Bat Walk and initially wrote it down on my plan as something for us both to do. As the time got closer, I decided that I fancied doing it by myself so I could leave the kids with Nerdish Dad - You can tell I haven't blogged for a month, I'm rambling so bear with me. Anyhoo, the day of the walk came and on and off it had been absolutely pouring down with rain. A few people had asked on the event page whether it was still going ahead or not and I was watching the sky, I even googled if bats can fly in the rain! (They can but prefer not to as it gets their fur wet and it makes them cold and it's harder to fly, in case you were interested). The confirmation came through that it was good to go, so I set off early as they'd advised there would be minimal places. I'm glad I did, as there was between 40 and 50 people who came, a couple of them had even travelled all the way from Chorley to come and take part. There were children there, which was nice to see. The people running the event were surprised at the turn out considering the weather. Once we'd all gathered, the bat expert and owner of an amazing moustache, Paul Robinson of South Lancashire Bat Group, started off with a talk about bats and gave us some basic information. There are 18 species of bats in the UK, but these are all from just two families. He reassured us that all UK bats only eat insects and none of them were vampire bats (though vampire bats only feed off cattle and the like as humans are too twitchy haha!) It was really fascinating, learning things like bats have to drop to fly, they can't just take off from the ground. I'd never really considered anything like that. Paul did promise us that he'd try and name all 18 species of bat, I know he got to 13, so I'm still waiting on the final 5. It had rained on and off till this point, so we were warned, that we may very well not see much due to the weather, but we moved up under the trees, closer to the large pond/lake. While under the trees, Paul told us about the kinds of roosts that bats prefer and how bats sometimes (rarely) end up in your house by accident, usually if it's their first time out the roost and they can't remember which entrance it is to get back in. He also told us that bats actually don't cause any damage to your home as they don't chew. I always thought they were a "nuisance". One of my favourite things I learnt was about a lone, male, Greater Mouse-Eared Bat that hibernates down south every year. When doing the count, bat conservationists have to go out and just count him. Apparently he's at least 25 years old and they're not entirely sure where in Europe he flies in from, just that he's right on the edge of his range. Such a brilliant tale! Onto the bats!!! We saw absolutely loads. It was amazing watching them dart about, right above our heads and it was unbelievable just how fast they move. I was surprised to learn that bats actually have quite good eyesight, they just don't use it! Using echo location though, they can "see" a stick and the leaf that's on that tree and then the teeny tiny bug that's on that leaf! The Bat Team (that's what I'm calling them) took out some detectors and we could listen to the bats at work. I really enjoyed listening and trying to separate out the two different types of "click" that were happening as there were two different kinds of bats flying around us. Above us were Pipistrelle bats, which are the most common type of bat and then above the water was what I think were Brandt's bats...though I didn't hear clearly, so if I'm wrong, please let me know in the comments if you were there, or just know more about bats than me. We went to two further spots following the first to see more bats and we were so lucky that even with the weather, there were so many out and so active. Overall this was an absolutely excellent event and all for the price of a small donation (whatever you could donate) to bat preservation on arrival. I'm really hoping more events are put on like this locally in the future.